Voted Best Personal Injury Law Firm | Hupy and Abraham, S.C.
Hupy and Abraham, S.C. has been named “Best Personal Injury Law Firm” in the Wisconsin Law Journal “Reader Rankings” Awards two years in a row. In addition, our nationally recognized law firm and attorneys have received some of the most prestigious awards and accolades in the industry. Over 70,000 clients have turned to Hupy and Abraham for outstanding legal service. Learn about our clients' stories and experiences working with us. “Great experience, would highly recommend the law office of Hupy & Abraham. Fast settlement and very helpful and informative during the whole process. Also, great customer service. They treat you like family and make you feel like they care.” Izylah C.
“The team at Hupy & Abraham are highly professional, very helpful and easy to work with. I say 'work with' lightly as they handled everything from start to finish and made what could have been an even more stressful situation, very manageable. Taking care of my legal matters while I was free to focus on healing.” Gail G.
“They helped me tremendously with my car accident case. I couldn't have been happier with their service.” Brian J. “They were very professional and committed to making sure I understood the process and what my rights were. I was very satisfied with the firm and would recommend them to anyone who needs an attorney.” Charles F.
More than $1 BILLION collected for thousands of satisfied clients. Committed to the community for more than 50 Years. Our personal injury lawyers are experienced in helping people who have been hurt in all kinds of accidents throughout Wisconsin, Illinois, and Iowa. Contact us by filling out a contact form, chat, or call 24/7/365. A member of our legal team will answer your questions, and gather information about the accident, your injuries, insurance and more. We will come to you. 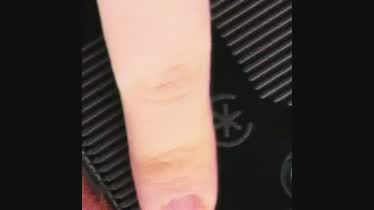 24/7/365. Hupy and Abraham settles property damage claims free of charge to get you back on the road as soon as possible. We’ll do all the work. You focus on recovering. Once you’ve fully recovered, we’ll gather all of your medical bills and begin assessing the value of your case. Your attorney will start negotiating with an insurance adjuster, who will review the case and potentially make an offer. Your attorney will contact you about the offer. Together, we decide what steps to take next. If you reject the preliminary offer, your attorney will prepare to file a lawsuit. Both parties obtain evidence. Depositions of parties and witnesses are taken as needed. 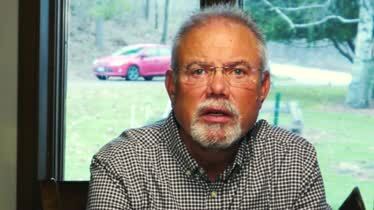 A third-party mediator will try to help both parties come to an agreement. If the case isn’t settled at mediation, your attorney will prepare to take your case to trial. Your case can still be settled at any time if a suitable offer is made. After the case is heard by a judge and/or jury, a verdict is announced as to the award. All medical bills and liens will be paid. Reductions will be requested in pay backs to maximize the clients end result. You sign a settlement statement and receive your check! Our award winning law firm consists of over 25 highly rated attorneys and nearly 200 support staff. See why the attorneys at Hupy and Abraham are Voted Best, Rated Best year after year. Hupy and Abraham has 11 offices throughout Wisconsin, Illinois, and Iowa. If you can't come to one of our locations, we will come to you! Our involvement within the community and charitable efforts are just one of many ways we stand out from other law firms. The employees of the firm are active supporters of their respective communities throughout Wisconsin, Illinois and Iowa. Hupy and Abraham is proud to have donated over $1 MILLION to thousands of community organizations. We offer free consultations to answer your questions and discuss your situation. If we don’t win your case, you pay nothing! 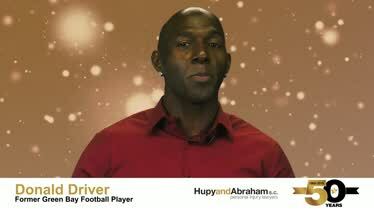 Donald Driver Wishes Hupy and Abraham, S.C. A Happy 50th Anniversary! 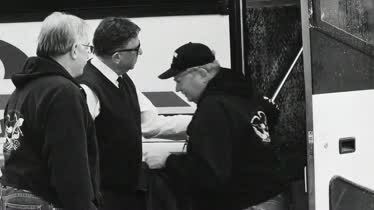 Hupy and Abraham celebrates 50 years of great client service. There’s a reason why Hupy and Abraham is voted best and rated best every year. Hupy and Abraham, S.C. 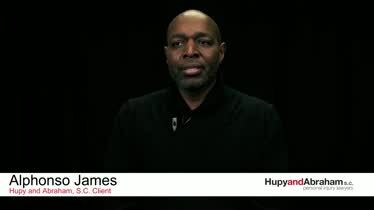 Client Testimonial - Alphonso James Hupy and Abraham, S.C. client Alphonso James talks about what it was like working with the firm after his accident. 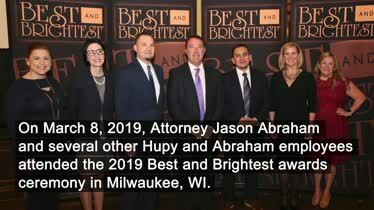 Hupy and Abraham, S.C. Named Best and Brightest in 2019 On March 8, 2019, Attorney Jason Abraham and several other Hupy and Abraham employees attended the 2019 Best and Brightest awards ceremony in Milwaukee, WI. Behind the Handlebars - ABATE of Wisconsin Lobby Day 2019 Behind the Handlebars Host Tony Pan Sanfelipo interviews ABATE of WI Legislative Committee Chair Steve Panten about the annual lobby day event.